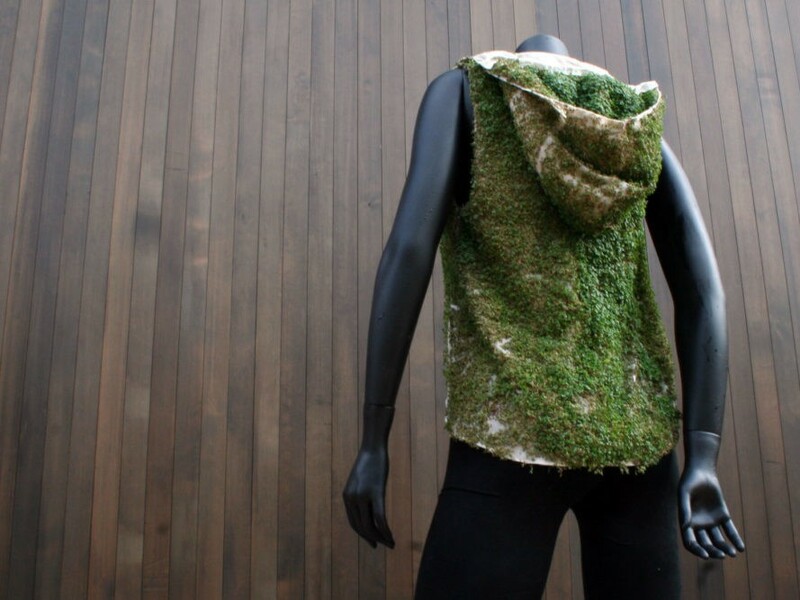 The Chia Pet is back, in wearable form, thanks to Elizabeth Esponette, a product designer who graduated from Cornell University with a degree in fiber science and apparel design. 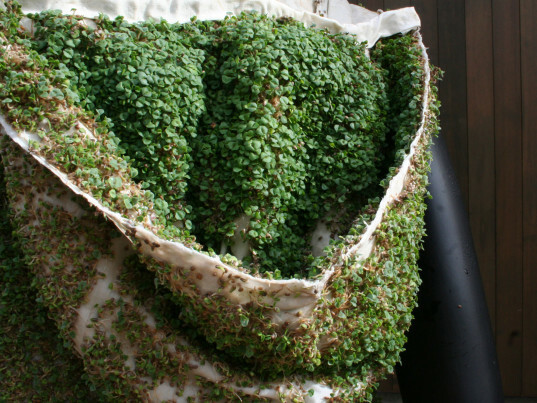 Her "Chia Vest," a hooded muslin garment that she's impregnated with sprouting chia seeds, is perfect for anyone who wants to show off their green thumb on the go. More than a fashion statement, however, Esponette's vest also plays on the symbiotic relationship between man and nature, and how we mutually benefit the other. The wearer's every exhale yields life-giving carbon dioxide to the embedded plant life, which in turn, gives off oxygen while absorbing toxins and other pollutants. To create her vest, Esponette laid out cut pieces of muslin on a foam mannequin that she saturated with water. She then planted the chia seeds, which germinated into tiny sprouts a week later. Once the chia reached an appropriate size, Esponette sewed the fabric into the the “garment it was meant to be,” she said on her website. As the vest continued to grow, it attracted some grazing snails. And, as long as the wearer exposes it to light and water to feed the photosynthesis process, the garment will continue to evolve like the living entity it is. By manipulating materials we’re comfortable in, and those we are not, she seeks to explore new structural and performance possibilities for the products we use. To create her vest, Esponette laid out cut pieces of muslin on a foam mannequin that she saturated with water. She then planted the chia seeds, which germinated into tiny sprouts a week later. Once the chia reached an appropriate size, Esponette sewed the fabric into the the "garment it was meant to be," she said on her website. As the vest continued to grow, it attracted some grazing snails. And, as long as the wearer exposes it to light and water to feed the photosynthesis process, the garment will continue to evolve like the living entity it is.